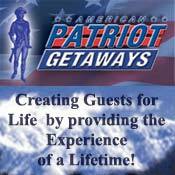 American Patriot Getaways specializes in Gatlinburg cabins and Pigeon Forge cabins. We have a variety of log cabins and chalets in locations near both Gatlinburg and Pigeon Forge. If youre planning an exciting family weekend at Dollywood and hiking some of the wonderful trails in the Great Smoky Mountains National Park, why not consider the convenience of our Gatlinburg cabins to complete the experience? Or, perhaps youre looking for the perfect getaway with someone special. What could be more romantic than being tucked away from the hustle and bustle of the rest of the world in one of our Pigeon Forge cabins? Why not break away from the vacation routine this year? Gatlinburg cabins and Pigeon Forge cabins offer a variety of amenities you just dont find in a hotel: private hot tubs, pool tables, fireplaces, Jacuzzi tubs, grills and mountain views. Call our toll free number (800) 204-5169 and let our vacation specialists help you choose one of the Gatlinburg cabins or Pigeon Forge cabins with all the amenities that fit your needs. If the Great Smoky Mountains, Gatlinburg, or Pigeon Forge is your destination, let American Patriot Getaways take the hassle out of your planning. With over 300 Gatlinburg cabins and Pigeon Forge cabins to choose from we know theres one perfect for you!